Discussion in 'The Water Cooler' started by Fix, Apr 4, 2019. GD I love this chick. In my eyes she is the best thing to happen to the GOP in years. Artem256, cantexian, Swamp Stalker and 3 others like this. I thought Pocahontas was a gift, I never imagined we'd also have Crazy Horse just a short time later. Artem256, oldnotdead, cantexian and 6 others like this. Artem256, oldnotdead, arrowflinger1 and 2 others like this. smctitan, oldnotdead, cantexian and 4 others like this. virginiashadow, greatwhitehunter3, cantexian and 4 others like this. Artem256, oldnotdead, greatwhitehunter3 and 4 others like this. This is amazing! Her very own joke thread. Thank you! Artem256 and Fix like this. nobody posted her absolutely insanely retarded vid she posted today of her rambling on the floor about global warming whilst stuffing her mouth with popcorn? Talking with her mouth completely stuffed full? A nice smiling face, high media presence, and a few "controversal" statements now and then. Everything a high-ranking politician needs nowadays. BowhunterX, Artem256, axtell343 and 2 others like this. "like....uhhhh.....chomp chomp chomp....like income inequality.....chomp....is like.....chomp......bad and stuff......chomp chomp"
Pinche puerca. Cara de caballo. I always thought she looks like she was raised in a barn; but her lack of manners proves it. I fear the failure of the conservative movement during the next major election cycle will be the complete disregard for the underlying messaging and concerns of the other side. 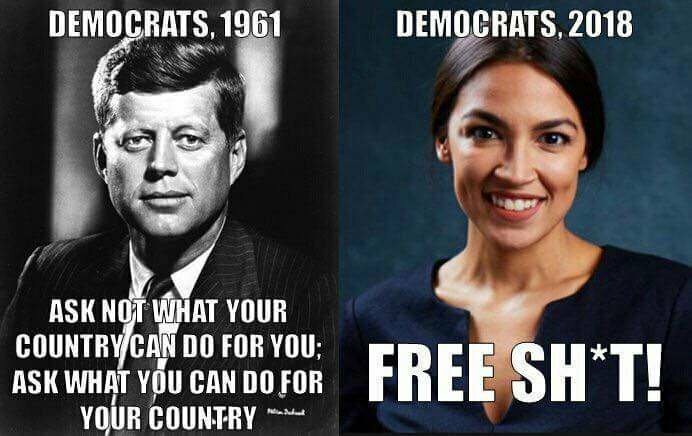 While AOC is clearly not the most eloquent politician we have, our dear President notwithstanding, she was elected to federal office by a large number of people. Regardless of her seemingly dim-wittedness, she represents a large group of people who are clearly dissatisfied with our current system and want to see real change. Oddly enough, it's not unlike the group of people who elected Donald Trump to be our President. Fed up with the status quo and looking for a change. Now her idea of change may be different than ours, but it doesn't change the fact that people like AOC and Bernie are gaining momentum. So now you have a bunch of, what the media would portray as, uptight middle-aged white republicans making jokes about her and dismissing her opinions which is only going to serve to make her stronger. That's why she was elected in the first place. So the more this type of thing happens, the stronger she gets. In a way, we're creating our own monster. You have to admit, it's a pretty amazing feat to go from waitressing tables to holding a federal office in the span of a year. If that doesn't send signals out that people are looking for a change, I don't know what does. Now carry on with the jokes. I do find them humorous. Okiebob, cantexian and siwulat like this. Other than her choppers and complete lack of regard for history; the only thing that scares me about her is that she is so proudly dumb, and proudly dumb is the new normal for pretty much the majority of college-educated under 30 year olds. Facts do not matter to this crowd. Artem256, 87TT, CoveyMaster and 1 other person like this. dnoodles, arrowflinger1, virginiashadow and 2 others like this. Yes, and more of that crowd is becoming politically and socially active. Yet, instead of attempting to educate or understand where their frustrations stem from, many simply make fun of them for being stupid and think that somehow the problem will go away. Okiebob and cantexian like this. Yep, this is the future of American politics if the RINOs don't pay attention to what their own people elected them to do. The discontent is simply becoming more obvious earlier with the political left than it is with the political right. The majority of people that lie somewhere in the middle of the two extremes are getting tired of both extremes and are underrepresented. This is sowing the seeds for radical change to the status quo. Both parties are leading themselves into a bad place. It is just being done slower by the political right than the left. Artem256 and Cooter/MN like this.